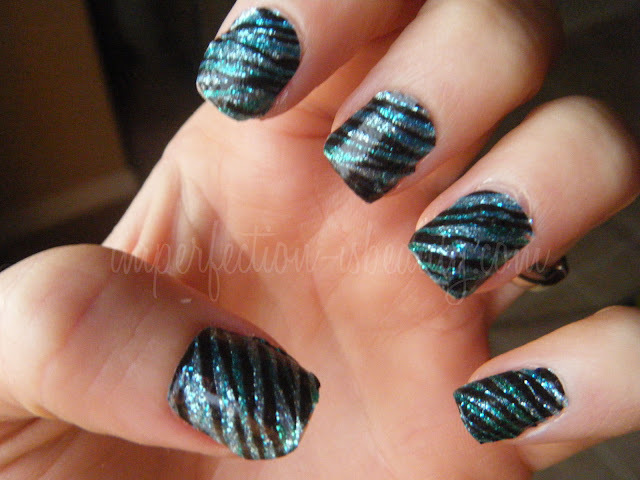 So a few Birchboxes ago I received these gorgeous turquoise glitter zebra print polish strips. First things first. I thought they were going to be just like the Sally Hansen Salon Effects nail polish strips. Unfortunately, they are not. The Sally ones do come with a lot more so you have a variety of sizes, and they attach to the nails so much easier. I'm not sure what it is about these but they would not stick to my nails in spots. They would either lift at the cuticles or start peeling at the tips. These lasted maybe a day and I had to take them off because they were flaking off in whole pieces once they started chipping. I'm sad they didn't work out as great as the Sally Hansen strips did. So with that saying I think my regular ol nail polish would last longer then these so as of right now I will be staying away from any strips for a while. Well until its a little more close to Christmas time because I do want some of those seasonal snowmen ones. Have you been loving any nail polish strips? They are really cool. I have my eyes on them from a very long time. I haven't tried the ones I got in my Birchbox yet, I guess I should use mine soon before they dry up!! I love nail polish strips so much, I hate chipped nail polish ugghhh! Those are pretty. Sally Hansen nail strips did not work for me, they would not stick properly to my nails. They look so pretty, its sad that they didn't work out. Thats interesting.. I tried out my birchbox Incoco strips and I loved them.. mine lasted for a whole week before starting to chip off. Did you wash your hands really well before applying them. If there is any natural oil or film on your nails before applying them, I could see why they peeled off for you.. Anyway.. love your design.. Mine looked like chain linked grafite.. pretty cool! I haven't tried nail polish strips yet,but these looks very pretty! these are are super cool haven't heard of them before and love the look on your nails.... ! I think you such a great job. Thanks for stopping by my blog...I appreciate your feedback!